A giant book sculpture in Paju Bookcity. Imagine a city where every business is directly related to books. As a writer and unrepentant bibliophile, that’s my idea of utopia; a slice of heaven on Earth. But, in South Korea, it’s a reality. Paju Bookcity was designed and built exclusively around the publishing industry. Originally conceived in 1989 by a group of publishers who envisioned a village devoted to books, the town literally has books and book production as its centerpiece. Here, residents place the “common good” above “ruthless self-interest” and work in buildings where architecture exists in harmony with the environment. The concept finally came to fruition in 2001; today, Paju boasts 150 buildings and is home to some 200 publishing companies. It goes beyond just a collection of chic book stores lined up on cobblestoned streets competing to see who can sell the best over-priced coffee with the latest romance novel or murder mystery. Everything about Paju, which sits about 20 miles north of Seoul, is related to books. Publishers even pay for buses to bring their staff to work. Among the unique structures is the “Moveable Type Workshop,” which sports racks of leaded letters and ancient typesetting machines. A writing system arose in China around 1,300 B.C., and the world’s first printing system appeared in the same region between the 4th and 7th centuries A.D. But, the Koreans didn’t adopt a formal writing system until the 15th century A.D. with the creation of an alphabet that suited their own linguistic needs. Understand that Paju is not a residential locale; it’s a business complex of sorts where about 10,000 people work. It’s divided into 3 sections: a Publishing District, a Printing District and a Support District. The overall area is owned by the Ministry of Culture, Sports and Tourism. Not surprisingly, Paju also stages its own annual book festival call “booksori.” On average some 450,000 people visit and about 200 author events take place over a 9-day period. It’s ironic that Paju is a short distance from the country’s border with North Korea; a staunchly communist nation not exactly known for free speech and free press. The presence of the “demilitarized zone” spawns enough tension for anyone living nearby. But, the idea of a community dedicated solely to the written word generates more peaceful aspirations and serves as a proverbial olive branch for distrustful enemies. After all, literacy makes people think before they act. For me, Paju Bookcity truly sounds like paradise. 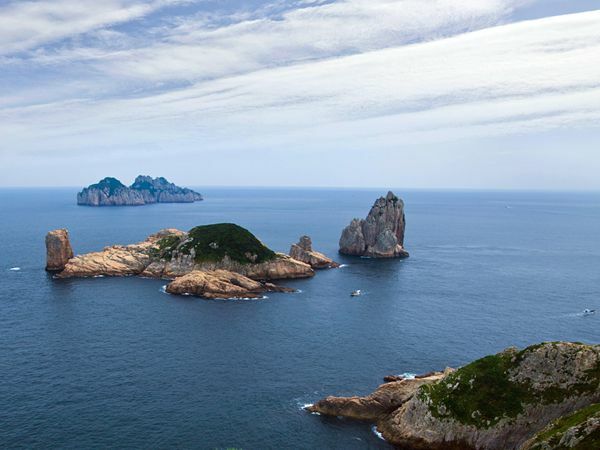 South Korea’s mountainous Yeosu peninsula’s contains 300-plus jagged islands, two protected national marine parks and a rich maritime heritage. Photograph by Topic Photo Agency.